Serve this with soft corn tortillas for making tacos, or leave out the tortillas altogether and serve it as a side. Simmer the potatoes in salted water to cover until tender, about 15 minutes. Drain, cool under running water, peel and cut into 1/4-inch dice. Heat the lard or oil in a heavy medium-size skillet over medium. Add the onion and potato, and fry, stirring regularly to ensure that nothing sticks to the pan, until the mixture is richly browned, 10 to 15 minutes. While the potatoes are browning, seed the chiles and slice them into 1/8-inch strips. Stir them into the potato mixture and season with salt, usually about a 1/2 teaspoon. Remove the mixture from the heat and stir in the cheese. Scrape into a small dish and serve with tortillas for making tacos. Thank you for your interest! We actually have a recipe for Skillet Tacos with a Red Chile Adobo Sauce that is in our upcoming Cookbook, More Mexican Everyday. Here is the link for preoder! You need exactly two ingredients and a couple of hours, largely unattended. Happy birthday to your brother. Let us know how it goes! 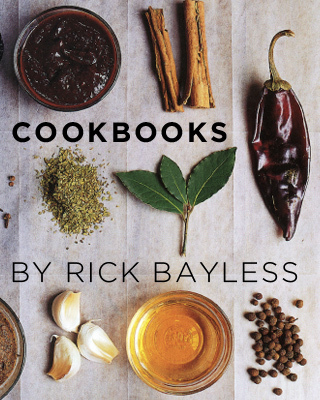 Thank you, Mr Bayless for the wonderful and easy-to-prepare recipes on your site! We always watch your show on PBS and LiveWell! So proud to be a Chicagoan knowing that your downtown restaurant is just a stone’s throw away! My hubby is a big fan! More power to you!